Looking to rent the best medium capacity power buggy in Rochester, Ithaca and Upstate NY? The Duke Company rents the exceptional Indy IPB-16, sixteen cubic feet capacity power buggy. 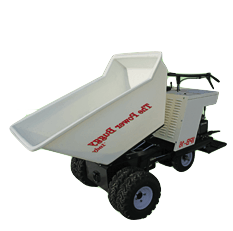 An essential productivity tool, professionals rent power buggies from the Duke Company to increase efficiency for a wide range of projects including construction, landscaping, material hauling and farm and ranch needs. Notably, all Indy Power Buggies are proudly manufactured in the United States. Simultaneous dump and hydrostatic drive, allowing for feather of the load in both forward and reverse. Sturdy operators platform and control system. Foot operated dump lever enables the operator to keep two hands on the steering handle at all times. Parking brake is foot actuated.